Recover Mjoll's beloved sword, Grimsever, from Mzinchaleft. Speak to Mjoll the Lioness in Riften. Find Grimsever in the Dwemer ruins of Mzinchaleft. Mjoll the Lioness lives in Riften where she spends her time speaking out against the Thieves Guild and talking to her faithful follower Aerin about the evils in the world. Acting on her convictions, she has taken on the responsibility of patrolling the town, which she does every day; from 9am she can be found in the Market, at noon she will be inside The Bee and Barb, and from 6pm she patrols the streets of Riften until midnight. Once you reach level 14, however, Mjoll will have more on her mind than just the Thieves Guild. In her younger days, she traveled and adventured all over Tamriel but lost her favorite blade Grimsever when she ventured into the ancient Dwemer ruin of Mzinchaleft. The dangers of the ruin nearly took her life as well, so she retired from adventuring and settled down in Riften. She admits that she feels defenseless without her blade and has a hard time finding a replacement. You can then offer to help her and, while she will refer to it as a 'fool's errand', she will also let you undertake the task, adding a map marker for Mzinchaleft. 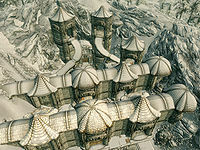 Mzinchaleft is a large Dwemer ruin located in the snowy tundra east of Morthal, northwest of the Hall of the Vigilant. Bandits now inhabit the first zones of the ruin and you will encounter up to six of them guarding the entrance. Fight them, locate the door and prepare for a very long dungeon crawl. Once inside, head down the first two slopes and fight the two bandits residing near the campfire. Proceed through the tunnels until you reach a room with two bandits and a cauldron. Dispose of them and claim some minor loot from the chest. At the intersection, kill the bandit and claim Maluril's Room Key from his body, then use it to unlock the gate. During the Dark Brotherhood quest Kill Maluril, the quarters behind the door will be occupied by Maluril but, during this quest you will find them empty. Read through the Speech skill book A Dance in Fire, v7 then backtrack to the intersection and proceed in a southern direction. In the next chamber you will witness two Dwarven spheres dispose of some bandits before coming after you. Fight them all and keep heading south, following the path as it twists and turns, and disposing of the various automatons along the way. Before long, you will reach an area with a handle and two gates, and several more handles behind the gates. Pull the only available handle and the gate to the east will open. Pull the new handle and the gate to the south will open. Pull the new handle and backtrack to the previous handle and pull it again. Go into a newly opened chamber to the south and pull the handle. Head south yet again and pull the handle, then backtrack to the previous handle and pull it again. Return to the very first handle and pull it. This opens the two gates to the southeast, giving you access to a valve. Activate the valve and the path will now be clear and provide access to the next zone, Mzinchaleft Depths. When the elevator brings you down into the Mzinchaleft Depths, the first thing you will notice is a dead Falmer and the recognizable sound of a chaurus on the other side of the locked door. The door hides a very large multi-leveled chamber filled with Falmer enemies and plenty of secret areas, so make sure to raid every corner before leaving through the door to the east. 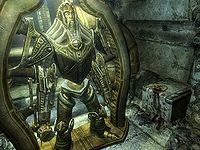 Two Falmer enemies wait in the next chamber, so dispose of them and proceed forward, into a tunnel-like system with more Falmer. Watch out for a tripwire triggering a claw trap as you enter the next room and fight even more Falmer and a chaurus. The tents contain minor loot and a dead bandit. Find the tunnel to the north and open a gate to another huge chamber with a fountain in the middle. Fight the inevitable Falmer enemies and head up the bridge to the north. At the top, fight another Falmer and locate the button and activate it. This will open the path in the southwestern part of the chamber. More Falmer wait on the other side, including a boss, so finish them off and head up the stairs to the north and the entrance to the third and final zone, Mzinchaleft Gatehouse. In the Gatehouse, you will only have to go around the corner before you will encounter the Dwarven Centurion that nearly killed Mjoll the Lioness back in the day. It will attack right away and will be accompanied by a Dwarven Sphere. After the battle, locate Grimsever, which is lying on a table. Find the boss-leveled chest behind bars to the north and pull the nearby handle to gain access. Lastly, if you have the attunement sphere, you can gain access to Blackreach from here. When all is said and done, open the western door and activate the handle to be brought back outside, emerging from an alternate entrance west of the main entrance. Back in Riften you will find Mjoll patrolling as usual. When you hand her the blade, she will be overly impressed: "Astonishing. To think you actually were able to reach it and yet return to tell the tale. Rarely in my travels have I encountered those who possess skills equal to your own. I see I still have much to learn. If you'd permit me, I'd be honored to accompany you in your travels for a time." Alternatively, if you told her of your hopes to join the Thieves Guild, she will instead say: "When you told me of your intent to join the Thieves Guild, I honestly didn't think we'd have much to speak about ever again. Yet here you are with my weapon that you could have easily sold or kept for yourself. Forgive me for my hasty opinion of you, I see that I was wrong and that there's much I can learn from you. If you'd permit me, I'd be honored to accompany you in your travels for a time." Either way, she will then be available as a follower and a potential candidate for marriage. Grimsever can be found within Mzinchaleft before acquiring the related quest from Mjoll. This will open the quest dialogue with her. Level 14 is required for the sword to spawn however. After completing the quest, Mjoll will be available as a follower, at which point you can "trade" inventory with her and take Grimsever back. Any smithing upgrades made to Grimsever before giving it back to Mjoll will be lost, though you can upgrade it again. If you are already level 14 or above when you first interact with Mjoll, you must also gain another level after your initial conversation and return to her before the dialogue option to begin this quest becomes available. Mjoll might not give you the quest to retrieve Grimsever despite fulfilling the above criteria, and Grimsever may not appear in the Mzinchaleft Gatehouse as stated above. You may use the console to make her your friend with player.setrelationshiprank 00019DF7 4, allowing you to recruit her as a follower. After using her as a follower for a few days, she may give you the quest, and Grimsever should spawn. You can use the console code player.additem 00053379 1 to give yourself the sword, then talk with her and give it to her. This may result in two copies of Grimsever being present in the game. If you level up and then talk to Mjoll again the quest will start normally. You still need to be level 14 or more. On the PC, it is possible to use the console to advance through the quest by entering setstage FreeformRiften09 stage, where stage is the number of the stage you wish to complete. It is not possible to un-complete (i.e. go back) quest stages, but it is possible to clear all stages of the quest using resetquest FreeformRiften09. Esta página foi modificada pela última vez à(s) 00h37min de 28 de janeiro de 2016.